DoubleRadius has been building wireless networks since 2001. Over the years, we’ve seen how our Internet Service Provider (ISP) customers have progressed from initial dial-up, DSL, and cable offerings to fiber and wireless for broadband connectivity. Although some Service Providers stick to either fiber or wireless in their networks, it’s not always a choice of one or the other. ISPs are coming to a new hybrid model from both ends of the spectrum (pun intended). Network operators that once relied exclusively on fiber or wireless are now being compelled to diversify for a combination of practical reasons. 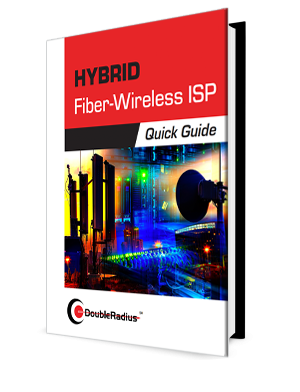 Whatever your current networking setup is, take a little time to dig into this Quick Guide right now, and consider as you’re reading if it’s time for your network to evolve, and for your company to become a Hybrid Fiber-Wireless ISP! What Is a Hybrid Fiber-Wireless ISP? When Should ISPs Evolve to Hybrid?